Hurry! FREE $20 Credit to Bloom.com = FREE Hair Products, Makeup & More! 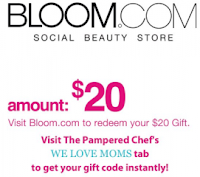 Hurry over to Pampered Chef's Facebook page to score $20 in Bloom.com credit for free! All you have to do is leave a comment about your mom, and the coupon code will pop up. You'll still have to pay shipping, which is $5.95. This is valid for the first 4,000 only! NOTE: The site is running pretty slow, so keep trying! It took me a few refreshes to get it.